Very lightweight and breathable road friendly shoe! Outstanding shoe at a great price along with outstanding service. This is my frist pair of giro and i am super please with them. I cycle on the weekend for over 100 miles and the fit and comfort is great. And they look great too. Big fan of Giro Empires for my low volume, flat feet. This innovative knit model doesnt disappoint. Bought these because I was trashing my other shoes sweating it out indoors on the trainer. These are really well ventilated , and after a 2hr Zwift session my feet dont feel like theyve been in a sauna. They are pretty narrow for a medium width though, especially in the heel and forefoot, so if you have wide Fred flintstone feet look elsewhere. Same sizing as my Empire Acc, and Shimano RC701- all 44. The stock footbed is above average quality, very comfortable and should work for most feet. You get a spare set of laces too. Super comfortable like slippers and feather light. The lower end EC70 carbon soles feel great pedaling, and are plenty stiff for my 158lbs and puny watts, but if youre a big power guy or sprinter, I could see how you may want for something stiffer. Look awesome too (greyhighlight color), cant wait to rock these outside when the weather warms up. 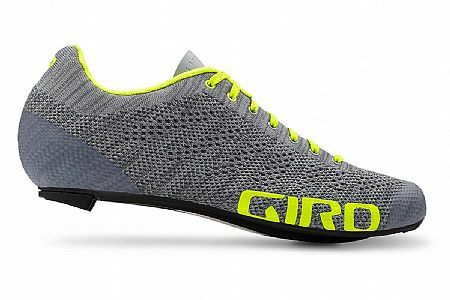 There are many things to love about the Empire Knit Shoe and one issue that should be addressed by Giro with the next redesign. I have a fairly wide fore and midfoot, but narrow heel (nobody is perfect) and despite the reputation of Giro shoes as narrow, these fit very well. The Knit material is far more forgiving than the most common synthetic materials used in cycling shoes these days. It is almost akin to natural leather, with the added bonus of all the extra ventilation. It stretch and confirm to the shape of foot and so far, I have not experienced. The heel is good and I have not experience any lift. My other shoe (Specialized S-Work 6, both in 46) has a roamer toe box (although it feels narrower as there is very little give) and a far more secure heel cup. I also love the lace, although, unless you are a true acrobat, you cannot adjust on the fly. The one thing that can be better is the sole. The EC70 sole is good, but not outstanding and compared to my S-Work, it feels like a wet noodle. I hope Giro will decide to use a stiffer one in the future. On the road, or as I am using this shoe, indoors on the trainer, it is super comfortable. The knit material is supremely breathable and I have to yet to experienced, hotspots, hot foot or sweating. Comfortable, well fitting shoe. Breathability is nice for warmer weather. Stiff yet forgiving sole. Been a big fan of the Giro Empire series ever since they were first released. Own the original, ACC, SLX, and now E70. They fit well with a roomy toe box and I like the laces which allow more customization for fitment depending on the ride. Pros These are the most comfortable of the series in my opinion due to the softer knit uppers. They are also more breathable which will be nice for warmer weather conditions. Cons Not sure how they would feel once the weather gets colder - toes may get too chilly and numb. I feel like the sole has more flex in it compared to the SLX and ACC when putting down hard efforts, but it's certainly no slouch. With the softer stretchy uppers, slightly more flexible soles, and great breathability, I think the E70's are the perfect shoe for longer rides (centuries, double centuries, brevets, randonneurs, etc) in warmer weather. Lastly, I love the rad styling, especially in the multi-color! I am familiar with Giro shoe products. The E70 seems to fit a bit more snug but is still extremely comfortable. I prefer lace-up shoes to strap and buckle, they are more comfortable. A very solid sole when pedaling. I also like the look of the mesh. I wear an 11US size and the Euro45 fits well. I love this shoe. Light, and comfortable. Been riding a long time, this is the only shoe that did not give me 'hot foot' on a 100 mile ride. Amazing adjustability, no more wide foot rubbing.